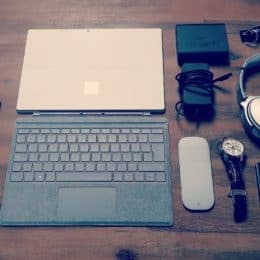 Surface Go – My first Impressions and why I bought it! I just received my Microsoft Surface Go. Yes, in Switzerland it was released just now, a couple of weeks after the US. The first review videos out there, did convince me that this is the right device I was looking for, but more to that later. In this short blog I want to give you a look at my first impressions of the Surface Go. First, let me tell you why I bought the Surface Go. I am a long time Microsoft Surface user, since the first Surface Pro. I went to several iteration of the Surface family and currently I am using a 15-inch Surface Book 2 and a Surface Pro. Surface Book 2, I like because of the power and screen size, and it is perfect for me to do some serious work. The Surface Pro is more less my light travel work devices to day. As you know I spend a lot of time travelling at conferences or to customer for meetings. Every weight and space I can safe during traveling is basically a great thing. A lightweight device for doing some simple work like mail, browsing the web or working with office would be enough for most of the tasks. Another tasks I need my device a lot for is taking notes. Since I started to use OneNote, I never took notes on paper again. Most of my note taking I do with the Surface Pen. Especially during meetings, it is much nicer to take notes on an almost flat surface, instead of hiding behind a laptop. 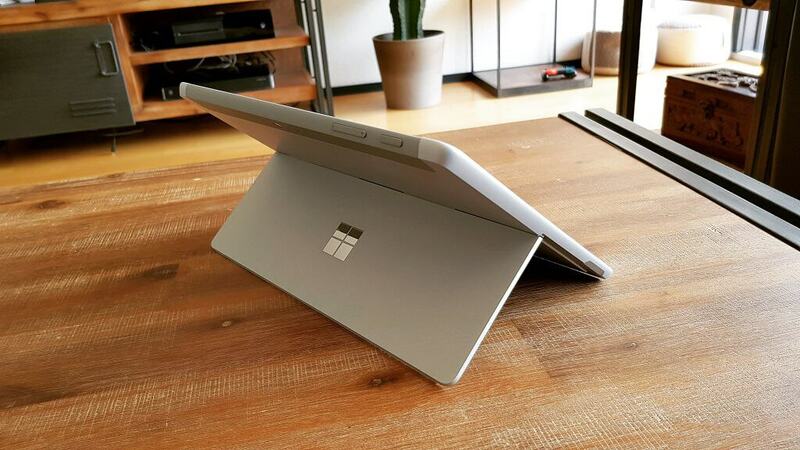 The Surface Pro and the Surface Go are prefect for this, since with the kickstand. They let you switch easily from taking notes with a pen, to using the keyboard. I know the Surface Go LTE version, comes later this year. I think this would be perfect, but with conference and travel season coming up, I didn’t want to wait. Let’s see if I upgrade later to the Surface Go LTE version. These always connected devices running Windows 10, cannot come soon enough. Let’s talk about my first impressions of the Microsoft Surface Go. The most important part is obviously the formfactor. The Surface Go is crazy small and light. It really feels great in the hand and it seems to be the right size for a small and light travel device. It is almost cute if you put it to the 15inch Surface Book 2. The build quality is great as expected from Microsoft Surface hardware. The performance feels great for the tasks I am looking for. Microsoft Edge and Outlook and the other office apps feel fast and responsive. The Surface Go also comes with a Surface Connect Charger, which is a great magnetic charging port. With that it can also easily connect with the Surface Dock and power my external monitor. However, the Surface Go also has a USB Type-C Port, and you can also charge the devices using a UBS charger. I also got the Signature Type Cover, which is a smaller version of the Type Cover which comes with the Surface Pro. It is small but typing feels great. It takes only a quick moment to get used to it. Great is the huge glass trackpad which on the Type Cover. I think this is the first Windows tablet I really can use as a tablet. With the size and weight, it is ideal to also use it as a tablet. For example the Surface Pro is only a little bit larger, but it makes a huge difference when you want to use it as a “portable tablet”. I found myself using Windows 10 in tablet mode a lot, and using the Surface Go in landscape and portrait mode. Audio quality seems to be very good for a device in that price category. And the front facing stereo speakers make the difference to other tablets. What I also really like is the great quality cameras which Microsoft has build in. If you record videos or if you do Skype for Business Calls and video meetings, the quality is way better than other tablets or even notebooks. My Workplace 2018 – How does yours look like? Last week I was browsing the web and I found a lot of cool looking home office setups. I realized it is quiet interesting to see how people workplaces look like. With that I want to give a quick look at my home office and my workplace setup. Secondly, I would like to share your setup as well. If you want to share yours write a blog, link it in the comments or show it on Twitter, what ever you like. This is it, this is my workplace if I am not on the road. My main machine today is the 15-inch Surface Book 2 attached to a Dell curved-ultrawide monitor (Dell UltraSharp 38 Monitor – U3818DW), which with Windows 10 and the Snap feature is absolutely great to use. I also have a Surface Pro as a company work machine, which I use mostly on the road when I need a real mobile work machine. It has enough powerful to do serious work and still gives you a mobile work experience. 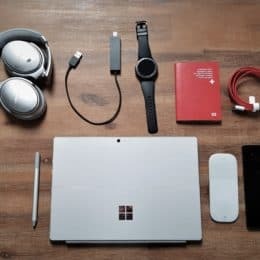 I am obviously using a lot of Surface accessories like the Surface Precision Mouse, the Surface Pen, the Surface Dial and the Microsoft Modern Keyboard. I like the Surface Pen on my Surface Pro to draw some quick stuff or take some notes in Onenote. Last week I got my early (or late) Christmas gift to myself. The Microsoft Surface Book 2 15-inch version was finally shipping to Switzerland. The 13-inch version of the Surface Book 2, was already available last year. I am a long time Surface user, since I got my first Surface and my first Surface Pro back in 2012. As you might remember I got a new Surface Pro 2017 as a new company device, back in July 2017. I picked the Surface Pro as a replacement for my Surface Book which I used quite a while and I am very happy with it. It is a light and mobile device, perfect when you are traveling. I think the new Surface Pro with LTE would even be better if you are on the road. However, one thing I always knew, was that I am more productive with a larger screen. 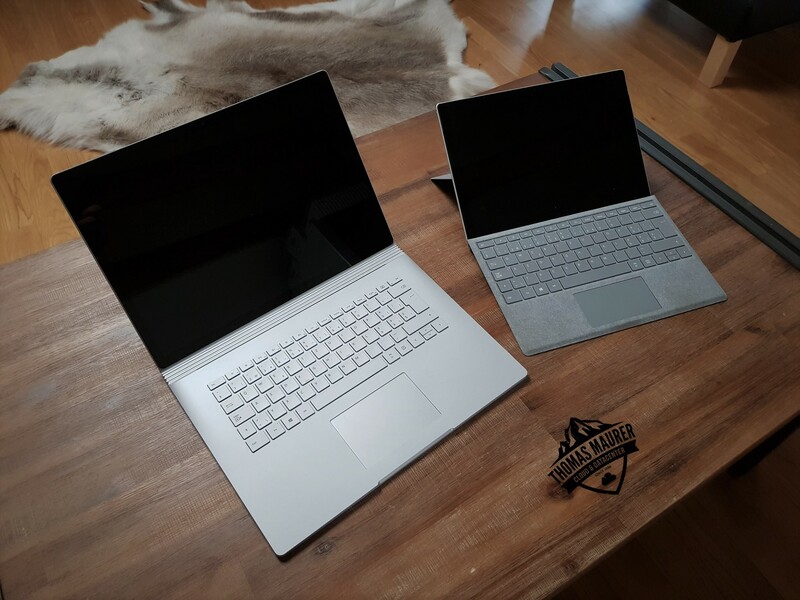 Even the 13” Surface Book, made a huge difference against the 12” Surface Pro. The thing is simple, it is mobility versus screen real estate. I am often working on the go, which means I like the mobility. On the other hand I am also working a couple of hours on the device with no extra screens. Having some extra space on the mobile device, makes me more productive. When Microsoft announced the new Surface Book 2 13-inch and 15-inch, I knew I want a 15” version. It would give me more screen real estate, more productivity, paired with the Surface quality and design. The combination of a 15” screen in a 3:2 aspect ratio, together with a touch screen and pen support, will provide you with the best possible work setup. The Surface Book 2 also comes with some performance improvements. With the higher end models, you get new 8th Gen Intel Core i7-8650U quad-core processor, and a Nvidia GeForce GTX 1060, which will provide you with the necessary performance. For me, these performance improvements are a nice addition, but not the reason I would upgrade. If you are a creator, designer, editor, you might highly benefit from the additional graphics performance. However, Microsoft also updated the disk to a faster NVMe SSD, and this you can see and feel in your day-to-day tasks. 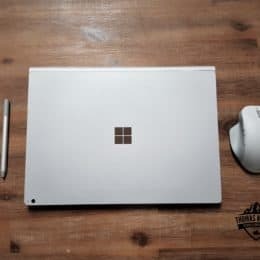 I haven’t used the Surface Book 2 long enough for a full review, but I want to share my first impressions. Hardware and build quality are amazing as for all the Surface devices, no surprises here. Performance improvements from the 8th Gen Intel Core i7-8650U quad-core processor, and the NVMe SSD are great. 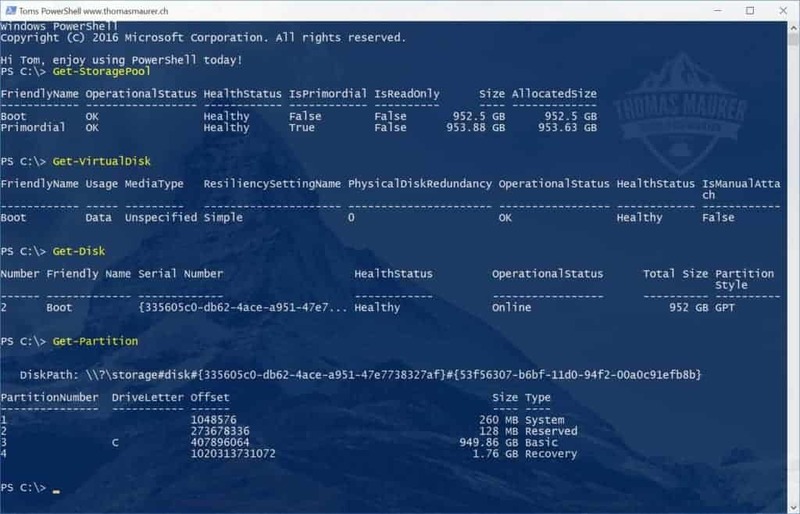 They are helping a lot if you are running Docker containers and Hyper-V on your machine. I can also imagine if you are doing graphic intensive work, you also benefit heavily from the Nvidia GeForce GTX 1060. The amazing 15” PixelSense display with the 3:2 aspect ratio and a resolution of 3240 x 2160 is just stunning and really makes a difference if you need screen real estate. The quality of the display is also amazing and you can switch between “Enhanced Mode” and sRGB. And as always I am very happy with the Surface Pen support. Yes you can still detach the screen from the keyboard to use it as a giant 15” tablet. 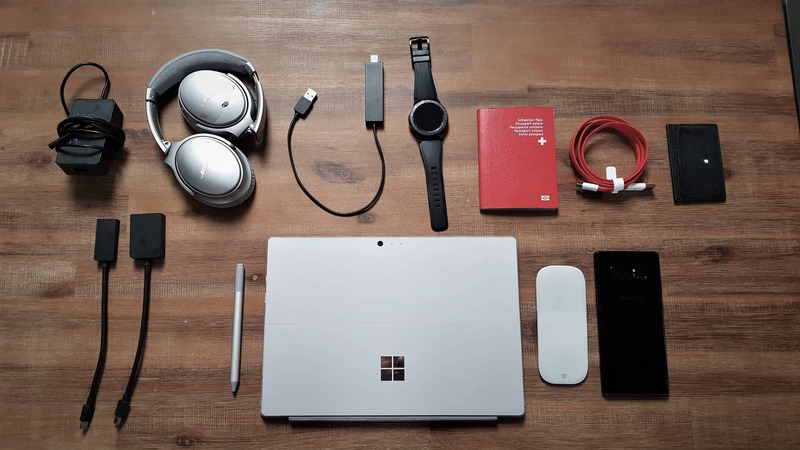 Microsoft now includes 2 x USB type-A (version 3.1 Gen 1), 1 x USB type-C (version 3.1 Gen 1 with USB Power Delivery revision 3.0), 3.5mm headphone jack, 2 x Surface Connect ports, Full-size SDXC card reader. The only thing missing is the Thunderbolt port, but to be honest I never missed it before, but of course it would be nice to have it. Of course the Surface Book 2 15” version is huge if you compare it to the Surface Pro or the Surface Laptop. With 1.9kg also heavier, but with the performance improvements, battery life and the larger screen, what else can you expect. However, if you undock the screen from the keyboard, the tablet part is still very light. 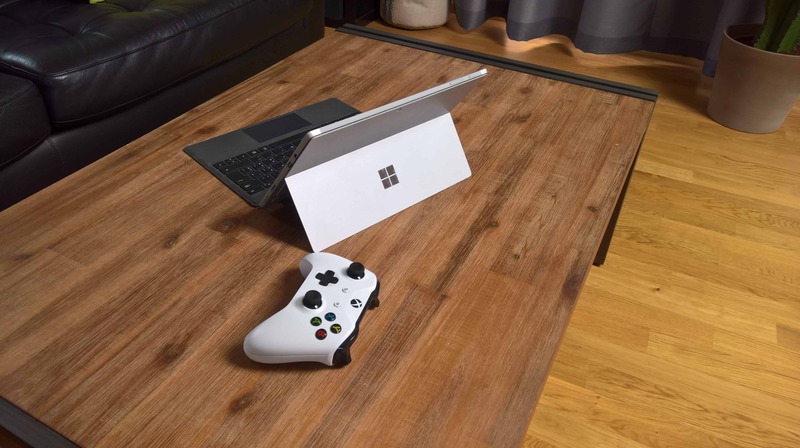 It also provides you with the necessary modern Wi-Fi standards a/b/g/n/ac, Bluetooth Wireless 4.1 technology and built-in Xbox Wireless for the 15-inch version. Since I am using it only since a couple of days, I cannot really talk about battery life. Microsoft claims up to 17 hours of video playback. To be honest the first Surface Book was already very good in terms of battery life. I think, with the Surface Book 2 I will make it trough a day. Of course it also ships with a Windows Hello face authentication camera. A 5.0MP front-facing camera with 1080p HD video and a 8.0MP rear-facing autofocus camera with 1080p HD video. Overall my first impression of the Surface Book 2 is amazing. The Surface Book 2 is the laptop I was waiting for, for a long time. I think this is the best notebook I have ever owned. Are you owning one, or thinking about buying one for yourself? Let me know in the comments. Soon again I am on my way to the Microsoft MVP Summit 2018 in Redmond. The Microsoft MVP Summit is the yearly, multi-day event, which is hosted at the Microsoft headquarters in Redmond and in Bellevue. The event brings a large catalog of technical sessions and variety of networking opportunities. The Microsoft MVP Global Summit enables MVPs from around the world to connect with each other, build relationships with Microsoft product managers, learn about upcoming technology and products, and provide feedback on Microsoft products and services. If I remember correctly this I my 7th MVP Summit, which I can attend. I am really looking forward as always and I am sure it is going to be great fun. Obviously you need to pack some stuff, to make the best out of the week. Especially since you need to take a lot of notes, and also work on some projects remotely. Besides my clothes and my running shoes, I also pack my latest tech stuff. 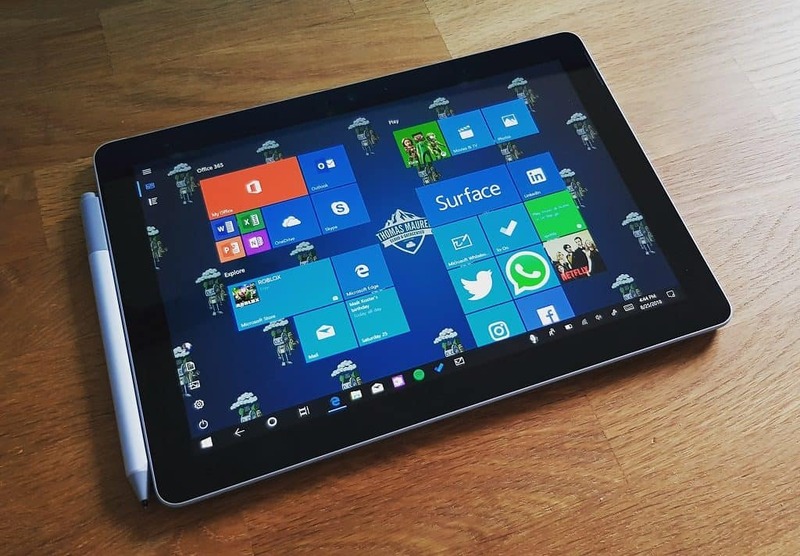 Surface Pro – As my daily driver I will bring my Microsoft Surface Pro, which is a perfect travel companion, since it is a small and light devices. As you may know, I also love to take notes in OneNote using the Surface Pen. The battery life should bring me more less through a day of work at the event. The Surface Pen – The Surface Pen is one of my favorite Surface peripherals to take handwritten notes during sessions. Samsung Galaxy Note 8 – After Microsoft really holds back on the Windows 10 Mobile investments. I decided to Switch to a Samsung Galaxy Note 8. The Note 8 looks beautiful, has a great camera, a Pen for OneNote. It also has enough battery life to bring me trough a long day. Microsoft Arc Touch Mouse – The Microsoft Arc Touch Mouse is my absolut favorite travel mouse. I am using a Microsoft Arc mouse since the first version and I am happy with the integrations Microsoft made. Bose Quiet Comfort 35 – The best travel Headphones I have ever owned. I like the new wireless capabilities and the noise canceling is perfect when you are stuck on a long flight. 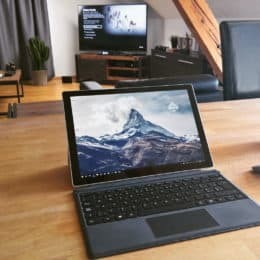 Microsoft Surface Adapters – Of course I bring a bunch of Surface Pro adapters, since you never know if you need to connect your Surface to a big screen. Microsoft Surface Power Adapter – This is a thing I really started to like. The Surface Power Adapter not only allows you to charge your Surface, but the extra USB port also allows you to charger your phone or another USB device at the same time. Next to that, I will bring some cables, sunglasses, even I might not really need them in the Seattle area this time of the year, and a bunch of other stuff you need during an event. By the way it is funny to see, how the inside of my bag change over the years. 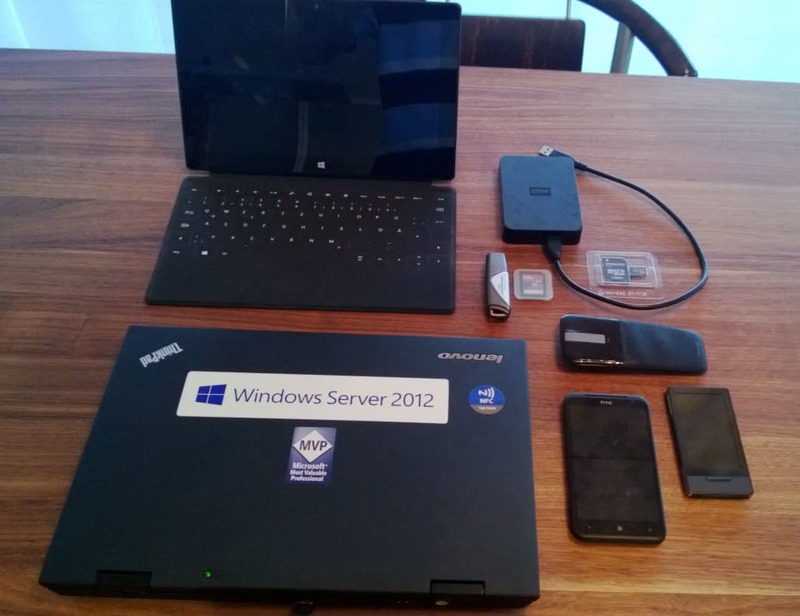 I wrote a similar blog post for the Microsoft MVP Summit in 2013. When I was carrying a Lenovo Thinkpad X1 and a Lumia 920. A couple of weeks ago I got my new Microsoft Surface Pro, I decided to go with the 1TB version to have enough space. After the first minutes of setup I quickly wanted to run disk optimization, which for SSDs usually does quick trim operations. In my case this was running way longer then on my Surface Book, so I checked what was going on, and I realized that it was running Optimization on a Storage Spaces Virtual Disk, which is kind of strange. I checked the disk configuration and really, my Surface Pro (2017) does have a Storage Spaces Virtual Disk which it boots from. 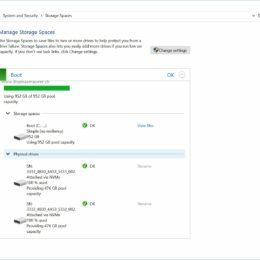 The Storage Spaces Pool does include two physical 512GB NVMe drives with one Virtual Disk on top configured as simple (striped) volume. Right now I don’t know how they did it, but it seems now possible to boot Windows from a Storage Spaces Virtual Disk with the Windows 10 Creators Update or some Surface team magic. Then when Storage Spaces was introduced with Windows 8, boot from Storage Spaces was not possible. In a couple of hours I will catch my flight to Orlando FL to the Microsoft Ignite 2017 conference. I am happy to join the itnetX team and be able to speak at the largest Microsoft Conference this year. I am really looking forward to it and meet other enthusiast around Microsoft Cloud solutions and of course meeting with members of the Microsoft Product Group. I am already preparing and packing stuff for my two weeks trip to the United States. After Microsoft Ignite I will spend another week on the Microsoft Campus in Redmond (Okay, actually it is in Bellevue at the Azure Cloud Architect Bootcamp) so I have to pack enough stuff so I can pre productive for these two weeks and especially Microsoft Ignite. 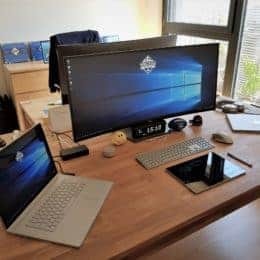 My main devices is of course my new Microsoft Surface Pro which I use as my 3-in-1 device, replacing my notebook, tablet and desktop using the Surface Docking Station. Of course it is running the latest Microsoft Windows 10 Insider Preview. Battery life I get is around 8 hours depending on what I am doing I get even some more. I will leave my Surface Book, which I was using for over a year and was my daily driver for a long time, back home. The Surface Pro is lighter much more portable, and especially at a huge conference like Microsoft Ignite, it helps to have a light devices to carry around. As my day to day phone I use the Microsoft Lumia 950 XL (Yes sometimes I still use a Windows Phone) and the Samsung Galaxy S8+, which are the perfect devices for me with great cameras to take picture from the place I travel to and listen to music. Even I like the track pad of the new Surface Pro Signature Type Cover I think I am more productive using a mouse. For that I got the new Microsoft Arc Mouse, Microsoft delivered together with the new 2017 Surface Pro. It follows the same line of design as the Microsoft Arc Touch Mouse and others, which are perfect for traveling. If you don’t need them, you can just click them, to turn the off. The Bose Quiet Comfort 35 Audio Headphones and their Noise Cancelling feature are some real life savers. I like them especially when I travel and have some long flights. But I also like that they now support bluetooth, so I can connect wirelessly. I also use them for Skype and Skype for Business calls. I am also carrying the Garmin Forerunner 325 which helps me tracks the steps I walk during Microsoft Ignite and the limited sleep I get during this event. Trust me, you will definitely walk a lot during that conference. For presentations I got a Microsoft Mini-DisplayPort to HDMI and VGA adapter as well as the Microsoft Wireless Display Adapter which acts as a Miracast Receiver and is great for presentations. I also carry a USB 3.0 drive, since you never know when you need to share some files, which might be to larger to share over the conference WiFi. I just use power adapter of the Microsoft Surface Pro which also has a USB port for charging the phone, speaker and other stuff. Next to that, I will bring some cables, sunglasses and a bunch of other stuff you need during a conference. With that, hopefully see you at Microsoft Ignite 2017 in Orlando, and if you are there, contact me if you want to grab a coke, coffee or beer. 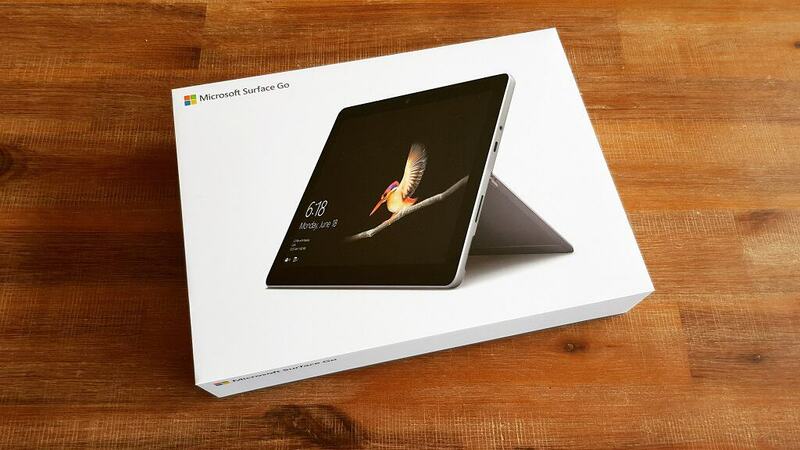 I am one of the lucky persons owning an brand new Microsoft Surface Pro as a new device for work. 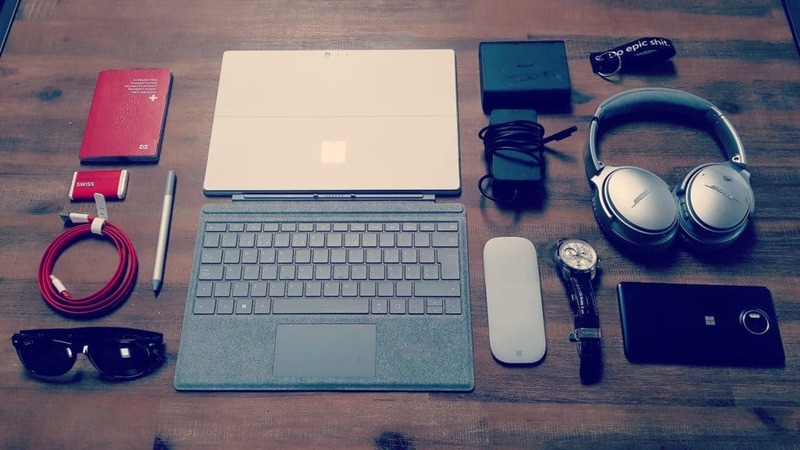 This is the my devices I used for the last couple of days and weeks as my daily driver and this allows me to write a quick review about my first impressions about the Surface Pro. After using the Surface Pro, the Surface Pro 2, the Surface Pro 3, the Surface Book became my daily driver. And I had to say that it is a great notebook. But after using the Surface Pro for awhile, I really got used to the form factor. 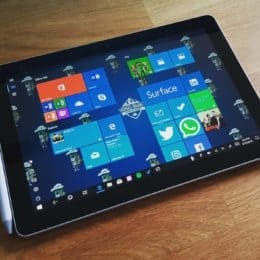 The 2-in-1 form factor and the small and light design, made the Surface Pro a really great travel companion and this was the reason I decided to go with a Surface Pro again. 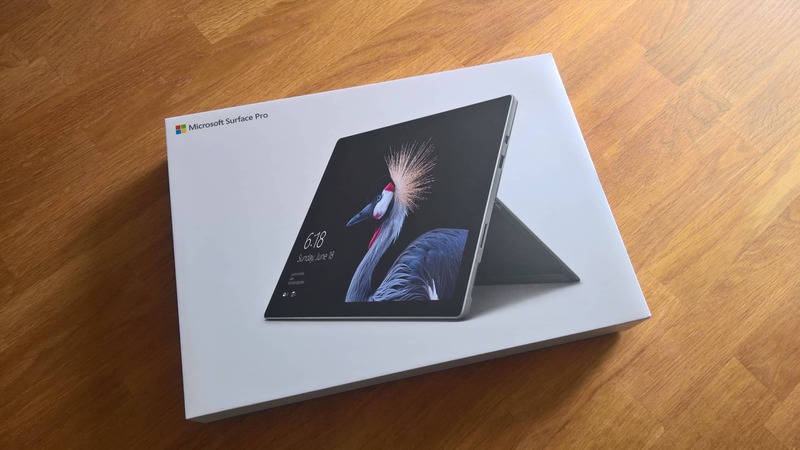 My first impression when I took the Surface Pro out of the box was: “wow, this feels premium”. Even the Surface Pro and the Surface Book always felt really great, Microsoft improved it even more. The amazing premium sound of the kickstand, the new rounded edges and the display making it even more premium and as mentioned the build quality is amazing. The second thing I realized while using it, is the resume form standby is incredible fast. You basically press the on button and you can start working. And this while battery life is still great, I get around a whole working day out of it with a single charge. Unfortunately I couldn’t really test the new Surface Pro Signature Type Cover, because it was not available at launch. But I will included it in my final review, after I have used it for a couple of weeks. Do you also have a Surface Pro? Let me know what you think in the comments.